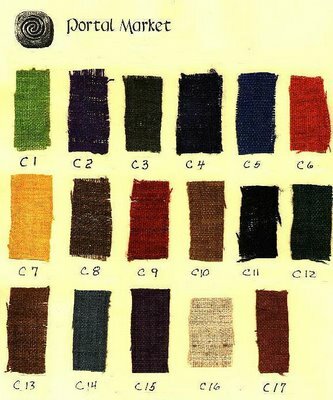 The picture shows hemp swatches. I've been researching hemp clothing for the new book. Just how eco-friendly is it? By all accounts, it's much better than conventionally grown cotton, the most pesticide-intensive crop in the world. I've been wondering though, if hemp is so great, how come most of the hemp-clothing vendors online don't promote their clothing as organic? I got the answer today. I called a major hemp vendor in California; his web site sells hemp clothing and other hemp products. He reminded me that it's illegal to grow hemp in the US, because it's technically the same plant as marijuana. I knew that, just forgot. Hemp however is from a variety of Cannabis that is useless as a mind-altering substance, because it contains hardly any THC. The hemp vendor I called told me that virtually all the hemp sold in the US is grown and manufactured into textiles in either China or Romania. I told him I had just seen the video "Wal-mart: the high cost of low prices" about Chinese sweatshops. I told him I was leery of any clothing manufactured in China. He said he'd been to one of the factories that produces his textiles. What was it like?, I asked him. It was "just a regular factory" he said. I didn't think to ask him about wages or hours per week on the job - those are two things that define sweatshops. Plus child labor and dangerous working conditions. I should call him back. But anyway, he pointed out to me that fabrics grown and manufactured outside of the US are not going to be certified organic by the USDA, because the USDA certifiers are not in China and Romania. He said even though hemp is not certified organic, it is earth-friendly. My reading has corroborated this. Hemp just doesn't have the voracious insect pests that are attracted to cotton, so pesticides are not needed. At least, they're not needed as much. I've discovered in my perusal of various sources this week though that bamboo is grown in China and woven into textiles in China. Just like hemp. Now wait a minute! I don't want to wear clothes made in China! After the "Wal-mart: the high cost of low prices" documentary about abusive labor practices and sweatshops in developing Asian countries, I don't want anything produced there. So we're back to cotton. Organic cotton. Cotton uses a lot of land, even organic cotton. But....at least some of it is made here in the US. I need to research more about wages and working conditions of cotton laborers in the US. And I need to read about linen from flax. But you know what the best answer is to the "green clothing" dilemma. Buy vintage clothing. I get most of my clothes from thrift stores. Three-fourths of used clothes wind up in the land-fill, so if I'm buying used stuff, I'm pulling it right out of the waste stream. I'm not supporting sweatshops or environmentally damaging practices. I'm lucky though, we have a couple of really good thrift stores in my town, where the clothes are in good shape and easily accessed. The best one is run by AmVets. More later on bamboo, hemp, and linen. Yesterday afternoon I was holed up at my work table, reading about organic cotton, and conventional textiles and toxic commercial dyes. I was working on the eco-groovy clothing chapter for the new book. Needing a stretch, I wandered out into the front yard. 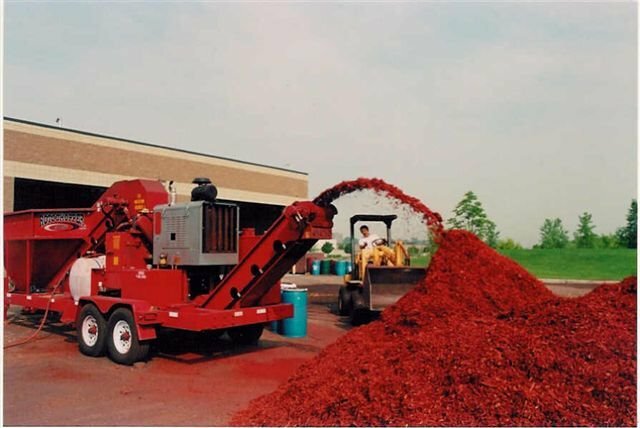 I noticed straightaway that the next-door neighbors had just heavily mulched their flower bed with a kind of mulch that's dyed red; it looks like dyed red hair. It's a garish bright red. Egads I said to myself. Their flower garden is just uphill from our organic vegetable garden, just a few feet away. I picked up a handful of red, red mulch and brought it inside, put it in a cup with a little water. After 30 seconds, I poured the water into a white cup. The water was dark red, opaque; the cup was stained red. I went back outside and looked at one of the mulch bags lying in their yard. It said "Red Colored Mulch." Manufactured by P&L Bark Nursery in Pageland, SC. I came back inside and looked at one of the textiles articles I was reading. It said, "Virtually all commercial dyes are toxic, made from petrochemicals with heavy metals." The son came to the door, parents were out. I told him how nice the flowers looked. He bought all the flowers and all the mulch himself, he said, an early mothers day gift. He planted them all and laid all the mulch down himself. (Ouch.) His hands and arms were still red. He liked the red mulch, he explained, even though it cost more than the non-dyed mulch. I showed him the red cup and explained about the organic garden, and toxic dyes. "But" he said "I thought if the government says it's okay, you know, if they sell it at Home Depot, it must be okay." Well. "I used to think that too," I said. "Then I started reading. Started calling people, interviewing people. Just because someone sells it, doesn't mean it's okay." We talked, in a friendly way. I told him I would be happy to scoop it all up myself, buy more un-dyed mulch and lay it down. I just needed permission to begin. He called his mom on her cell. An hour later we were all scooping up mulch. In about 30 or 40 minutes we scooped up 8 bags of red, red mulch, enough to fill both roll-out trash bins, theirs and ours. We cleared it out of their flower garden. I offered to buy more mulch, 8 more bags. They declined. We actually had a very friendly conversation during the whole thing. I was very nice, they were very nice. It probably improved our relationship. I was as extremely affirming of the son as I could be at every step. He deserves it; he's a neat kid. The next morning I put money to reimburse them for all the mulch into a card, a nice card, and taped it to the inside of their door. Said do what you like with it. Now they have mulch-less flower bed. The soil is still a little red, from the one watering he gave it before I saw it. Shouldn't we have more limits on chemicals in the environment? Dye on mulch serves no purpose at all. It's not even pretty. I think about the kid's red arms. I told him to wash them. I hope he did. We are looking for original content from writers and non-writers on the subject of personal experiences with green choices. It's for our book, from Fulcrum Publishing, 2007, tentatively titled How Americans' Spending Habits Shape Our World by Sally and Sara Kate Kneidel. 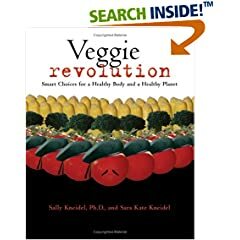 Like our last book, Veggie Revolution, this book will be rich with "community voices," your voices - brief quotes or short essays from actual experience. If you try to use your bike or ride the bus instead of driving, we'd like to hear what that's like for you, good or bad. The writing does not have to be perfect. A casual, conversational tone is often more effective. If you have comments that are journalistic or op-ed, that could work as well. Most pieces we use are 200-1000 words. Longer or shorter submissions may be considered if especially interesting or unusual. Your green experiences do not have to be exemplary to make good reading. In fact, imperfect efforts are sometimes more interesting. As Kermit says, It's not easy bein' green. organic cotton or wool, hemp, bamboo, recycled or vintage clothing, etc. local, seasonal, vegetarian, vegan, pastured, organic, etc. On the problems associated with huge corporations like Wal-Mart, International Paper, Smithfield, Tyson, etc. The deadline is June (prefer early June). We can use your first name, first and last name, or you may pen anonymously. It's up to you. Please send submissions to treeduck@earthlink.net. 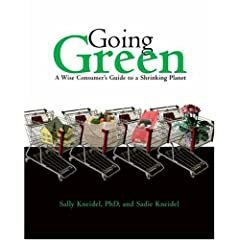 Send also a statement, in the email, saying that you (write your name and date) give us permission to use the piece in the book, specifically in How Americans' Spending Habits Shape Our World by Sally and Sara Kate Kneidel, from Fulcrum in 2007. To help us distinguish submissions from junk mail, please put “book submission” in the email’s subject line. Feel free to query first. Although we may not be able to use all items submitted we will do our best to consider everyone’s experiences as part of the overall project. 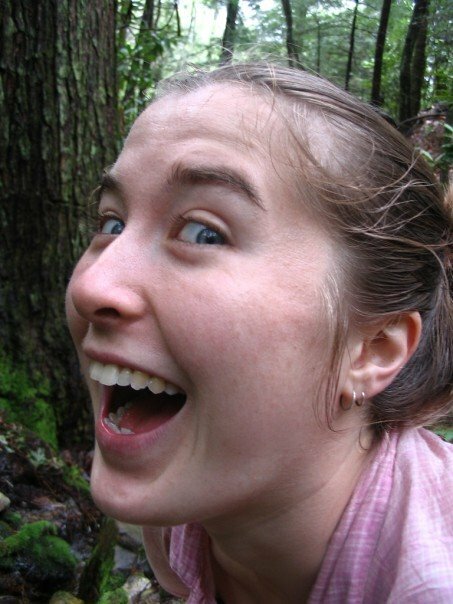 We’ll also post any omitted submissions on our blog, http://veggierevolution.blogspot.com. 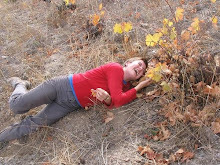 I've been researching organic and natural fibers for the new book. Fascinating. It makes we want to smack my forehead - for all the years I spent with my head buried in the sand. Here's the crux of it. Cotton is advertised as a "natural" fiber, as opposed to, say, nylon or rayon. And cotton can be natural. But, as some of you may know, cotton is one of the most pesticide-intensive crops there is. I've been hearing that for a few years, as I went right on buying cotton underwear, jeans, corduroys, T-shirts, sweatshirts. But I didn't really get it until this past week, which I’ve spent reading articles about the textile industry. It takes a pound, a whole pound, of pesticides and fertilizers to produce enough conventional cotton to make one T-shirt and one pair of jeans! What about those pesticides on cotton? Five of the top nine most commonly used cotton pesticides are Class I or Class II chemicals - the most toxic and carcinogenic pesticides. Like all chemicals, they're dispersed to some degree in the environment when they're sprayed on fields or crops. 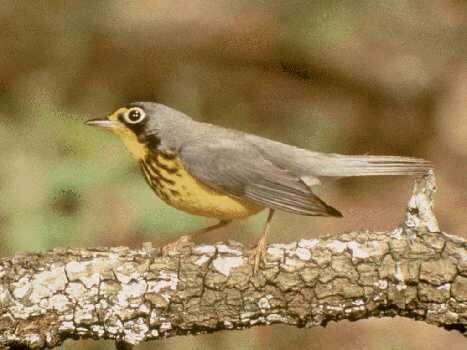 Ingested by birds, mammals, reptiles. Toxic to amphibians and fish living downstream from sprayed fields. Here's something that surprised me. Two-thirds of the cotton crop winds up in our food chain! So we're eating all those pesticides too! Cottonseed oil is common in processed food. And cottonseed hulls or meal is a common "protein supplement" for cattle. Cotton is also extremely toxic to workers. Ninety-one percent of laborers in the cotton industry have a diagnosed health disorder of some kind. What about clothing consumers? All these toxins wash out when the T-shirt or jeans are washed - right? That's what I've been thinking all these years. No. They are slowly emitted during the lifetime of the garment. What about "easy care" or "permanent press" cotton? Formaldehyde. That's what makes them "easy care". What about the dyes? "Virtually all commercial dyes are toxic petrochemicals, many contain heavy metals," said one of the documents I read last night. Like the pesticides, these dyes have their impact on the workers in the textile mills. They also have a heavy impact on the environment, because, at some point, the dyes wind up as wastewater. Dyes in particular are hard to remove from water, so cleaning or filtering processes, when attempted, often fail. To cut to the chase, even in the best circumstances, the dyes wind up in rivers. In developing nations, where many or most textile mills are located these days, the dyes can often be piped raw and unfiltered right into the rivers, with no effort at all to extract them from the wastewater. That's the beauty of overseas textile mills and sweatshops in empoverished nations - no labor laws to protect workers, no environmental regulations, no functioning governmental infrastructure to care one way or another what goes on. I hate to be the bearer of bad news. But, man, we need to be supporting the providers who are trying to make a living offering organic fibers. I said to my husband last night, we're not buying anymore conventionally-grown cotton socks or T-shirts or underwear or anything. Period. Here's the good news: there are lots of alternatives to conventional cotton. Here are the alternatives as I see them. Organic cotton: It’s grown without the massive amounts of pesticides and fertilizers used in conventional cotton cultivation, which is a huge advantage for the environment, for laborers, for consumers. Organic cotton products cost 25 to 50% more, but not choosing organic, for me, feels like once again sticking my head in a hole and saying, it’s not my problem. It is my problem. I want to be engaged with the world enough to say it is my problem, and your problem, and his problem. We have to take responsibility, choose who we wish to fund, refuse to participate in corporate systems that are screwing the environment, laborers, and consumer health. If you google “organic cotton” or “organic fibers” you’ll find organic cotton vendors online. Organic cotton isn’t perfect – the cotton dust can still cause respiratory ailments for workers. And the USDA organic certification only applies to how it’s grown. It doesn’t apply to the manufacturing process. But the Organic Trade Association offers an additional certification for the manufacturing process, which affects the use of formaldehyde to reduce wrinkling, and the use of toxic dyes. Vintage clothing: Ah, yes. Being a cheap-skate and bargain-hunter, and being poor (struggling writer married to high school teacher), I partake heavily of the thrift store offerings in my town. We have a great thrift store, operated by AmVets. Every so often, when I’m with Sara Kate, we stop and do an inventory of what we’re wearing at the moment, how much of it came from Community Thrift. Usually I’m about 90% clad in Community Thrift items: shoes and socks included. Thrift store purchases are guilt-free. The average American buys 48 new clothing items every year and discards an almost equal number. Most of the discards wind up in the landfill, about 10% are recycled. Of the recycled, about half make it to thrift stores. The rest are shredded to make blankets or commercial rags, and I don’t know what else. True, some thrift store items can still have toxic dyes – any dye that bleeds into laundry water is also absorbed into your skin when you wear it. But at least I’m not funding the corporations that are trashing the environment and exploiting laborers to offer cheap new products. Instead, I’m funding a non-profit with a humanitarian mission. Organic wool: I was surprised to read about all the toxins used to produce wool, a lot of them in the form of dips applied to the living sheep to kill parasites. Again, these miticides and so on are toxic to both workers and the environment, not to mention the animals themselves. Organic wool is grown without the use of these pesticides. Linen (from flax) and hemp have their merits as clean and green alternatives to conventional cotton, in some cases. We’ll write more about those in the book, and in later blog entries. I read a good bit about bamboo fiber yesterday. It seems to have a lot going for it, in that it doesn’t require heavy use of pesticides or fertilizers. It also grows to maturity in three years and doesn’t need reseeding. And from what I’ve read, it can be as soft as cotton, which hemp is not. But, bamboo is typically grown and manufactured into textiles in China. After watching the documentary, “Wal-Mart: The High Cost of Low Prices,” I’m leery of anything manufactured in China because of labor concerns. That movie documented exploitive working conditions and abysmal wages for workers in Chinese factories. Also, none of the vendors I came across who are marketing bamboo clothing online are claiming to have an organic product. So…I’m not sure about bamboo yet. I plan to make some phone calls next week. So. As I discover more, I’ll report it here, and in our upcoming book from Fulcrum in 2007. The working title was The Power of Your Pocketbook, but is now How Americans’ Spending Habits Shape our World. Fulcrum will most likely select a new title altogether after the book is completed. I would love to hear from you readers about your adventures in trying to sort through the new alternatives to conventionally produced fabrics: your impressions, frustrations, and successes. We’re looking for reader submissions to include in the book. You can send submissions to treeduck@earthlink.net. I've been researching rammed earth houses today, and reading over an interview I had with home owner and real-estate agent Gary Phillips near Chapel Hill. 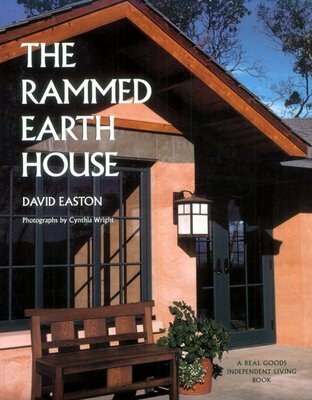 He built a rammed earth house with a little help from his friends. It's a beautiful two-story cottage that I would never guess is made from soil. The surface of his outside walls is not painted, plastered, or stuccoed. It's just a smooth light-brown surface. If I didn't know what it was, I guess I'd think it was some kind of tinted and slightly textured concrete. It's that smooth and even. Gary's rammed earth walls are 2 feet thick. When I visited his house, he explained to me that each wall is made by pouring soil with a front loader into a concrete box made of two 8-ft-tall sheets of vertical concrete that are two feet apart. As each load of soil is dumped inside the box, a work crew gets on top of the soil and tamps it down with a pneumatic tamper, layer by layer, until they reach the top of the concrete form. The completed soil wall has to "cure" for only 24 hours! Then the concrete is moved and wall stays where it is! That's amazing to me. Gary put iron oxides between some of the layers of soil in his walls just for aesthetic reasons. The oxides leave undulating dark horizontal striations in the finished wall, a charming effect. Sara Kate and I will be writing more about Gary's house and about other earthen building materials in our upcoming book about green consumer choices. We spent the last week, more or less, in Asheville NC doing promotional stuff for Veggie Revolution. Sara Kate is working right now at Sunnybank Inn near Asheville. We did presentations at two colleges (Mars Hill and Warren Wilson), at Malaprops bookstore, at two natural food stores (Earth Fare and Greenlife), and at the Asheville Friends Meeting House. And an interview on WCQS radio. Sara Kate was interviewed last week by The Mountain Xpress, a weekly newspaper in Asheville. It was a pretty intense week, but fun. Asheville is a refreshingly progressive community, especially for North Carolina. I enjoyed the profusion of liberal and environmental people with attitudes. I liked this bumper sticker: "Where are we going? And why am I in this handbasket?" I want more bumper stickers! Elmer Hall, who owns Sunnybank Inn, and Matt McGuire, who works for Elmer, set up most of the events. Just to promote the book. I am very grateful for that, I know it was a lot of work. Between the two of them, I think they know just about everybody in Asheville. Others who helped make the series of events go smoothly were Aubrey Raper, John Templeton, and Laurie Pedersen of Mars Hill College, Alsace and Andrew of Malaprops bookstore, Megan of Earth Fare, Dustin Rhodes of Warren Wilson College, Amy Joy Lanou of UNCA, and Mary Alice Lamb who served us all a gourmet vegan dinner. We met loads of interesting people. Elmer was right up there at the top. He's a Buddhist and an Episcopal minister. How does that work? He went into the Peace Corps after college and taught high school in Singapore, where he had lots of Buddhist and Taoist friends. The Inn is full of Asian wall hangings and zen meditation cushions. After his Asian thing, Elmer returned to the States, went to grad school, and became a chaplain at Duke University. 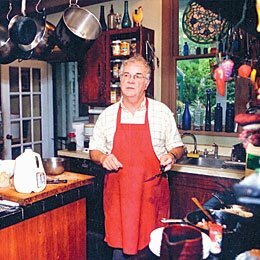 Did that a few years, then he and some friends opened the first vegetarian restaurant in NC. Now he and his 3 or 4 employees offer beds and scrumptious vegetarian meals to hikers from the Appalachian Trail, which runs right across the Inn's front yard. When prodded about Buddhism's messages for life, Elmer told me that human suffering comes from our desires. Americans want too much, he says. If we desire less, then we'll suffer less. I tried to get Elmer to tell me more about living simply, and about the connection between suffering and desire, but he declared himself unable to ponder such matters while chopping onions for the evening meal's soup. He was blotting his eyes at the time, from onion fumes, so I had to relent. Next time. The other folks who work at the Inn were equally entertaining. Matt - well, Matt's just one of my favorite people period. I've known him for a couple of years, and he's always good for an adventure. Matt is a young man who can spring from full slumber to breakfast duty in a matter of, literally, seconds. With a versatile 'do and threads, he's at the ready day or night. He does have to set his internal alarm clock the night before, or efforts to rouse him the next morning will fail. So he says. Matt and Sara Kate have been interested in sustainable food for a long time. The two of them thought up the theme "Food Ethics" for the communal household they lived in at Guilford College last year. Matt and Sara Kate also ran Guilford's community service program for its students in Guadalajara Mexico last fall. That was one of their biggest adventures. Matt will ride his bike from Asheville to Charlotte and back when the urge strikes him, and think nothing of it. Sleep beside the road somewhere. Or from Guadalajara to the Pacific coast, he's done that too. He's a lad unfettered by conventional thinking. Jonathan is an interesting guy too. He works at the Inn, and at Elmer's farm, up the road. Jonathan introduced me to stewed or steamed nettles, which are quite tasty. He claims that nettles and other wild greens are higher in nutrients than cultivated greens. I believe it. While the hikers at the Inn feast on waffles or pancakes or Sara Kate's spicy muffins for breakfast, Jonathan eats every morning what he calls rice "gruel." It's a bowl of brown rice with something added. While I was there he had acquired about 40 lbs of someone's surplus apples and had made apple sauce. A lot of apple sauce. So the next morning he had, I think, nettles and apple sauce on his gruel. It doesn't sound that good. But it looked good. I think it was good. He was enthusiastic about it. I asked Jonathan what his favorite food was, thinking he might say chocolate cake or pie or something like that. He's 24. Young men like to eat. But he said tomato sauce. After that, cucumbers. In summer, he says, he can eat a cucumber every 10 minutes. Or he might alternate between cucumbers and spinach. He's partial to dark green winter squash too. And Japanese pumpkins. Jonathan is going to be food maverick in some way. I can see he's building up steam toward something, some new way of thinking or writing about food. Just about the whole time I was at the Inn, Jonathan was in Elmer's big kitchen, experimenting. Cooking up something crafty. He's nice too. He shared a whole square of his precious vegan chocolate with me. A little square. But still, a whole one, just because I was curious about it. Now I know about vegan chocolate. Brian also works at the Inn. He regaled us with his travel stories on more than one occasion, until we were in danger of losing bladder control. I especially enjoyed the one about the Canadian nurses, and the German hostel where the youth group tossed the mattresses out the windows, and the wombat in Australia that turned out to be a territorial basset hound. Thank you Brian. I look forward to more stories, and to hearing the real truth about Starbucks, and the insider scoop on the coffee industry. The second largest commodity traded in the US (in volume of trades). Is that what you said? The panel discussion on sustainable food that we participated in at Mars Hill College on April 6 was one of our favorite events of the week. We met Andrew Euston of GreenBridges Sustainability Consulting there, also saw Pat Tompkins and other illustrious persons in the green community near Asheville. During the panel we were talking about the resistance factor that keeps people from getting on board the humane and sustainable food bandwagon. Lots of folks wish to believe that, here in America, we can trust what the government tells us, and can even trust what corporations tell us. The average American wants to believe that no one is engaged in false advertising, that the goal of big business and our administration is to serve and protect the interests of consumers. At the Mars Hill panel discussion, we talked about how giant food corporations do not have our best interests at heart, but rather exist to create profits for stockholders - and we talked about how scary it is to take the first step in admitting that. It's scary to admit that all is not well in the food industry. Because once you admit that, it opens the door to disillusionment. It can lead to a complete change in world view. What do you trust? Andrew Euston used the word "grieving." We all agreed that when we first admit we're being lied to and deceived by food corporations and the government, we grieve the loss of trust, the loss of innocence, the loss of our illusion of safety. The solution, we agreed, is to educate oneself, to become informed consumers. To buy local food from providers whose methods we can see. To be selective in who we choose to support with our consumer dollars. For more information about finding local humane and sustainable providers of produce and animal products in the mountains, contact the Appalachian Sustainable Agriculture Project. For information about local food elsewhere in North and South Carolina, contact the Carolina Farm Stewardship Association. Elsewhere in the country, check out your local farmers' markets and look at Local Harvest and Eat Wild. If we all are willing to change our diets a little bit, to support providers who are raising food without fouling the environment and without keeping animals in misery, then we can put the corporate meat giants out of business. We really can!